PMOG, a multiplayer online game (MOG) that lets users accumulate points while passively surfing the web and then use those points to help or hurt their fellow players, launched out of private beta this morning. We first covered PMOG back in February. To play PMOG you need to install a Firefox add-on that lets you interact with other users asynchronously on websites you visit. You spend points accumulated by surfing the web on things like mines, which you leave on websites and explode when the next player visits the site. Points are deducted for tripping a mine unless the player has spent points on armor. Other users can also attach “St Nicks” to users who leave a lot of mines, which causes their next mine not to work. I spent most of my time and points leaving mines all over the web, and then suggesting that founder Justin Hall to go to those sites. For some reason I never got tired of this. 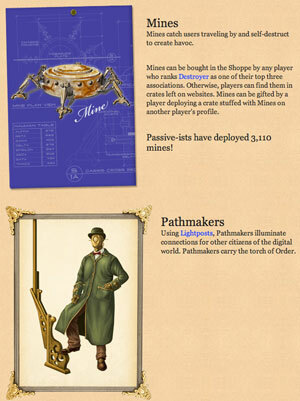 But other players create various missions that direct users, in a StumbleUpon fashion, to topic-specific sites. PMOG has about 15,000 users and the company that created it, GameLayers, says they are ready to open up to everyone that wants to play. The video below give a short tour of the service. More information on their CrunchBase profile.